WASHINGTON (AP) — The resounding Senate crash of the seven-year Republican drive to scrap the Obama health care law incited GOP finger-pointing Friday but left the party with wounded leaders and no evident pathway forward on an issue that won’t go away. In an astonishing cliff-hanger, the GOP-run Senate voted 51-49 to reject Majority Leader Mitch McConnell’s last ditch attempt to sustain their drive to dismantle President Barack Obama’s health care overhaul with a starkly trimmed-down bill. 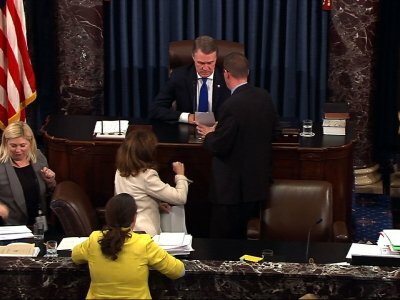 The vote, which concluded shortly before 2 a.m. EDT, was a blistering defeat for President Donald Trump and McConnell, R-Ky., who’ve made uprooting the statute a top priority. “They should have approved health care last night,” Trump said Friday during a speech in Brentwood, New York. “But you can’t have everything,” he added, seemingly shrugging off one of his biggest legislative setbacks. Trump reiterated his threat to “let Obamacare implode,” an outcome he could hasten by steps like halting federal payments to help insurers reduce out-of-pocket costs for lower-earning consumers. Senate Democrats were joined in opposition by three Republicans — Maine’s Susan Collins, Lisa Murkowski of Alaska and Arizona’s John McCain. The 80-year-old McCain, just diagnosed with brain cancer, had returned to the Capitol three days earlier to provide a vote that temporarily kept the measure alive, only to deliver the coup de grace Friday. “3 Republicans and 48 Democrats let the American people down,” Trump tweeted Friday. He tweeted later that the Senate needed a rules change to “immediately go to a 51 vote majority, not senseless 60,” even though on the crucial vote a simple majority of 51 votes, including a tie-breaker by Vice President Mike Pence, was all that was needed. “Hello, he only needed 51 in the health care bill and couldn’t do it,” Senate Minority Leader Chuck Schumer, D-N.Y., helpfully reminded reporters. Earlier in the week, Republican defections sank two broad GOP efforts to scrap the 2010 law. One would have erased Obama’s statute and replaced it with a more constricted government health care role, and the other would have annulled the law and given Congress two years to replace it. The measure that fell Friday was narrower and included a repeal of Obama’s unpopular tax penalties on people who don’t buy policies and on employers who don’t offer coverage to workers. McConnell designed it as a legislative vehicle the Senate could approve and begin talks with the House on a compromise, final bill. But the week’s setbacks highlighted how, despite years of trying, GOP leaders haven’t resolved internal battles between conservatives seeking to erase Obama’s law and moderates leery of tossing millions of voters off of coverage. “It’s time to move on,” McConnell said after the defeat. Friday morning, House leaders resorted to singer Gordon Lightfoot to point fingers. They opened a House GOP meeting by playing “The Wreck of the Edmund Fitzgerald,” a ballad about the 1975 sinking of a freighter in Lake Superior. Lawmakers said leaders assured them it was meant as a reference to the Senate’s flop. The House approved its health care measure in May, after its own tribulations. One moderate Republican said Trump shared responsibility. Lawmakers spoke of two possible but difficult routes forward. In one, balking GOP senators could be won over by new proposals from leaders or cave under pressure from angry constituents demanding they fulfill the party’s pledge to tear down Obama’s law. But both of those dynamics have been in play all year without producing results. In the other, there would be a limited bipartisan effort to address the insurance market’s short-term concerns. That would provide money to insurers to help them subsidize some customers and prevent companies from driving up premiums or abandoning regions. Schumer said he hoped the two parties could “work together to make the system better” by stabilizing marketplaces. But many conservatives oppose such payments and consider them insurance industry bailouts, raising questions about whether Congress could approve such a package. Associated Press writers Ricardo Alonso-Zaldivar and Stephen Ohlemacher contributed to this report.